Online shopping is thriving and is the latest craze among people. In fact, it’s not just a craze; rather, it signals a complete shift in the behavior of consumers. People are visiting the web for majority of their shopping. They simply visit a couple of websites to get the products they want. Online shopping stores, e-stores, internet shops and online shopping malls help people choose products from a wide variety. Visitors get latest and detailed information regarding new and upcoming goods along with their pictures. They have more choices including more products to purchase, increased means to compare products and their prices and more ways to assess products. Increased consumer demand and wide variety of available products. Strong demands of consumers and increasing number and variety of goods available are the reasons behind stupendous growth of online shopping. Increased Demand leads to Increased Spending. Nowadays, people are doing most of their purchases online and are spending more on it. As per the BI Intelligence, (Business Insider’s premium research service), there has been an increase in the number of US online shoppers by around 20 million(from 2015 to 2016). Moreover, total amount spent by consumers online increased to $68 billion in Q1 2016 from $61 billion in Q1 2015. In addition, there has been an increase in the number of online transactions by 115 million (from 2015 to 2016). The following interesting and curious statistics and data about online shopping and e-commerce industry (through an annual survey undertaken by UPS (ups, +0.43%) and analytics firm Scor.com – (scor, 0.00%) will make the viewpoint more clear. Consumers, for the first time ever, admitted to having purchased more of their products online than in the stores, revealed according to the fifth annual UPS Pulse of the Online Shopper™ study involving nearly 5,000 online shoppers. Nearly 71 percent of shoppers are of the view that they shall get a better bargain online that in stores. 80 percent of the global internet users have made purchases online while 50 percent of the global internet users have bought more than once. The sixth study reveals that 40 percent of consumers admit to making up to 7 purchases online through an average 3-month period. Here are also the details of the independent study conducted by The Centre for Retail Research (CRR) covering the UK, Germany, France, Italy, Spain, Netherlands, Belgium, Austria, Switzerland, Sweden and Poland. Generally, 36 percent of people spend nearly half an hour on comparison shopping before taking any decision to buy something while 65 percent spend 16 minutes+ doing so. In 2016, around 1.61 billion people globally bought goods online. In the same year, global retail sales amounted to $1.9 trillion. By the year 2020, the figures are likely to go up to around $4.06 trillion (projected growth between 8 and 12 percent in the coming few years). Online shopping has not only grown in popularity but is considered to be relatively much secure and safer than it was a few years ago. 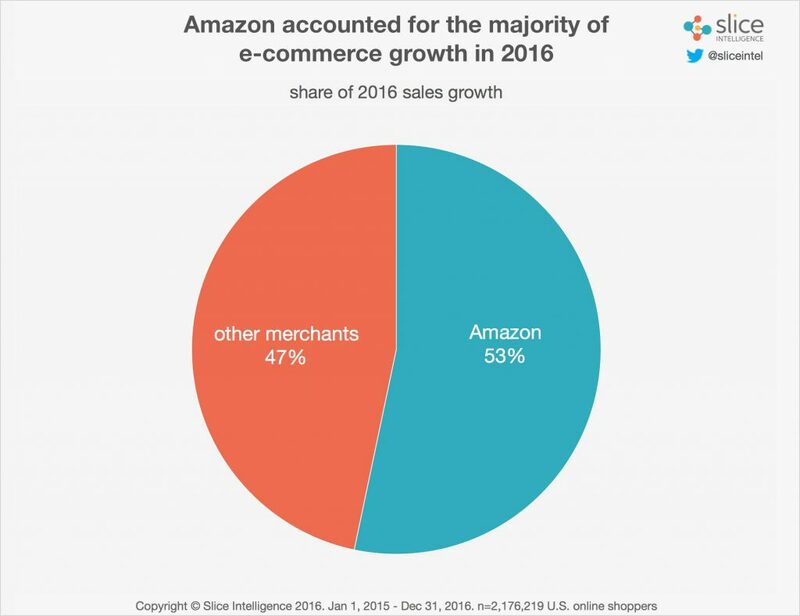 As per the figures by Slice (the receipt mining company) which picked data from more than 2 million digital transactions, around 53 percent of all US online sales growth (2016) was from Amazon (showing an increase from 40 percent in 2015). The reason why online shopping has become so easy and practical is due to the latest type of user-friendly e-commerce platforms. Such platforms enable small business owners and entrepreneurs to cash in on this new trend by selling online from an online store, a website or a blog. Online shopping offers convenience of shopping (to people) from the comfort of their homes. Consumers have the facility to buy products worldwide from their PCs, smartphones or even tablets. And they can get it delivered right at their door step without any fuss. So, who will not love this idea? No wonder, nearly 51 percent of Americans are of the view (NRF’s survey) that online shopping is, undoubtedly, the best means to shop (while around 49 percent prefer to shop in-store). Americans spend roughly 36 percent of their total shopping budget online. Nearly 52 percent of mobile owners use e-banking/online banking, an indication of a yet another trend favoring mobile shopping. In 2016, shoppers spent majority with e-commerce market places. The growing popularity of online shopping has led to a noticeable increase in the number of e-commerce websites over the last couple of years. There are millions of online stores (nearly 12-24 million e-commerce stores) engaged in selling goods on the internet worldwide. The continuous growth of online shopping is going to multiply the number of e-commerce websites in the coming years as well. With internet shops getting more and more popular, each seller must be represented online. Although e-commerce is showing a growth of 23 percent year-over-year, still around 46 percent of US small businesses don’t have a website, reveals a report by Clutch (a business-to-business research firm). Hence, the role and growing importance of e-commerce (especially mobile e-commerce) becomes evident from the fact that there has been a massive increase of 213% in the mobile e-commerce in 2017 (it increased from $1.5 trillion in 2013 to $3.2 trillion in 2017). With a plethora of products and information available to consumers online, we can acknowledge the increasing significance and potential of a well-developed E-commerce website for online shopping. After all, an online shop is not just about a landing page but a good website plus a good mobile version that is fast and reliable. User-friendly and Mobile Friendly E-commerce Website. You need to ensure that online shopping experience must not only be user-friendly but also mobile friendly if you want to ensure an optimized purchasing experience on mobile devices of varied sizes. Your e-commerce site must have an easy sign-up process. Moreover, customers must be able to find your contact information details including customer service phone number, address and hours of working easily at your e-commerce website. Authentication. Yet another important feature that your e-commerce website must have is strong authentication requirements. This is keeping in view the identity and security of your customers intact. Reliable and Fast. An e-commerce site needs to offer reliability (little downtime) and must be fast (in terms of load speed and server response time). As per the sources, slow performance significantly affects mobile users with figures suggesting an increase of up to 26 percent in peak frustration along with 8 percent decline in engagement due to 500ms connection speed delay. Consumers are quick (nearly 43 percent) to move to a competitor’s website when confronted by a negative experience (slow load time) while doing mobile shopping. So, the clue is to choose a hosting provider that can handle high traffic to your site and also ensure fast page load time. Easy Navigation. Moreover, easy navigation is yet another important factor for e-commerce websites, believe 59 percent of shoppers, as per Chain Store Age. Easy navigation saves energy and time of customers. So, an online shopping website must have various categories (and subcategories) to allow consumers to their desired search. All this reinforces the relative importance of a good mobile-friendly e-commerce website. Clear Payment Choices. Always mention all the details (no matter how unimportant they seem to be) regarding to payment options clearly to ensure customer satisfaction while using your e-commerce website for online shopping. Domain Name Registration and Buying Web-hosting Space Vital for a Powerful Online Presence. Creating an online shopping site shall enable you to get connected to a large number of customers, who shall see your products (and services) on online brochure. Hence, the first and foremost step here is to make your online presence felt. For this, you need to find a good and a reliable web host. A web host is a firm that shall store files of your website on its servers and send them to your customers’ (and readers’) browsers. Go for a web host that offers simple to use services, a wide variety of useful schemes for businesses along with a 24*7 customer support (preferably by phone or at least through a helpline). To conclude, we can say that e-commerce and online shopping is already a multi-billion industry. As the time passes by and buyers globally become more confident about the safety and on-time delivery of their goods, online shopping and e-commerce is predicted to (rise in popularity) witness a growth of between 8 and 12 percent in the next couple of years. As per BI Intelligence forecasts, US consumers’ online spending will reach $632 billion in the year 2020. Thus, the message here is clear - this region of merchandising will keep on enjoying a positive outlook for a long-long time. So, happy online shopping to all of us!